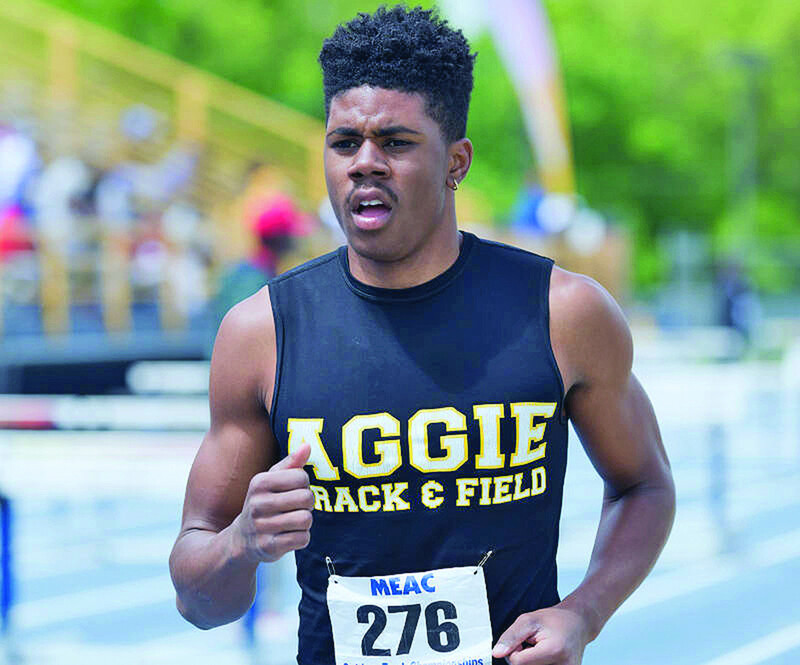 North Carolina A&T track and field’s home debut had its positive moments Saturday afternoon during the Aggie Invitational at Irwin Belk Track. On Senior Day, senior Tiffany Ellick won the women’s triple jump. Junior sprinter Christopher Belcher had a day that included being a part of the men’s first-place 4×100 meter relay team and winning the 200 meters. There were also five additional first-place finishes for the Aggies. There was a downer to the Aggies home debut as a swirling unrelenting wind coupled with frigid weather conditions made it difficult for all the athletes competing. For Ross, however, going through the adversity of the weather, competing at home and building on the successes and failures of Saturday is all about building toward the next time the Aggies return to Irwin Belk Track – May 5-7 for the Mid-Eastern Athletic Conference Track and Field Championships. Belcher looks like he is headed toward readiness in May. He teamed with freshmen Michael Dickson, Rodney Rowe and junior Maurice Eaddy to run a 40.95 in the men’s 4×1. The men’s 200 also belonged to Belcher on Saturday as he crossed the finish line in 21.45. Two other Aggies finished in the top-5 of the 200 in Eaddy (21.87, 3rd) and Dickson (22.02, 5th). Maurice Eaddy, a NCA&T junior sprinter, finished fourth in the 100m dash with a time of 10.48 seconds and third in the 200m with a time of 21.87 seconds. Photo courtesy of Charles Watkins. In the 100, Belcher had the second-fastest qualifying time in the 100 at 10.41 before finishing third in the final with a time of 10.35, slightly finishing ahead of Eaddy’s fourth-place time of 10.48. Belcher’s 100-meter finishing time in the final is under the 10.55 he ran at Florida Relays last week. Freshman Justin Hamilton also had a first-place finish on the track for the men as he ran the 400 in 48.08. In fact, the Aggies took the top three spots in the 400 as sophomore Dujuan Harding (48.59) and junior Dorrian Claggett (49.36) were second and third respectively. The women’s sprinters weren’t too shabby either. The women’s 4×1 team duplicated the men’s effort by coming in first. Freshmen Yakira Love, Kayla White and sophomores Morgan Knight and India Brown combined to run a 46.66, more than a full second behind the 45.49 the 4×1 team ran at the Alan Connie Shamrock Invitational on March 18. Brown, who won nine 60-meter races during the indoor season including the MEAC title, was a multiple winner on Saturday by winning the 100 in 11.78. Sophomore Miranda Green represented the female distance runners by winning the 1500 in 5:00.03. N.C. A&T took ownership of the triple jump as freshman Lasheon Strozier jumped 46-feet, 10 ¼-inches to win on the men’s side. The women’s triple jump victory was a little more symbolic as Tiffany Ellick, who was honored during a Senior Day ceremony along with teammates Perry Cabean and Demetria Dickens, jumped 39-feet, 1-inch to celebrate. Cabean was a third-place finisher in the men’s 3000 meter steeplechase (10:17.47) while Dickens came in third in the women’s hammer throw (133-feet, 5-inches) and discus (130-feet, 5-inches).